And that’s the design part. More importantly, the content… The title of the chart seems to suggest that it is just an example of how to use 2x2 matrices, but I think people are serious about its content. A comparison of apples and oranges. I need to start casually learn how to do data cleaning, and not yet get into AI but be prepared for it, and to use AI, I don’t need to understand statistics at all. 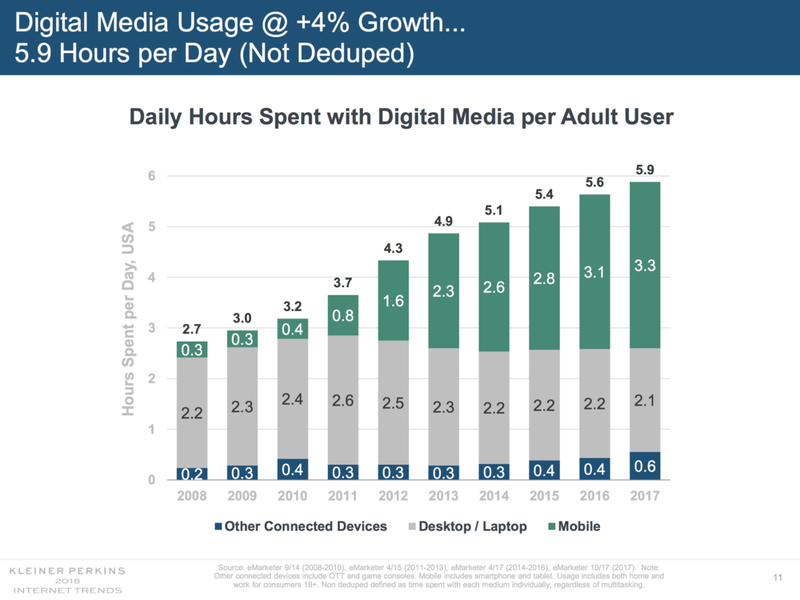 Mary Meeker published her 2018 Internet Report: hundreds of PowerPoint slides filled with dense information. This is a presentation for pondering and study, rather than seeing it as a backdrop for an entertaining TED talk. For this purpose, the slides look pretty decent. I picked a random slide from the beginning of the deck and tried to improve things a bit in "SlideMagic-style"
The columns don't add up because of rounding, I left it that way, but usually, I would change the value of the biggest column segment to make the numbers add up, it somehow looks sloppy when there are "calculation errors"
A complete purist would argue that this chart is actually the wrong one to support the 4% growth point, there are no growth percentages anywhere on the chart. I put up the above slide on the SlideMagic template store, anyone can download this one free of charge. The backbone of almost any management consulting project (and final presentation) is some sort of quantification of options. In essence, the quantification is the communication. Strategic options can be hard to compare, evaluate. Uncertainty, risk, lack of information, dependencies, short term, versus long term. Throw these in an average politically charged management meeting and the outcome is almost certain: indecision. A quantification is convenient: simple rank the "score" and the answer rolls out. Every option can be compared objectively. Well, objectively to a certain extend. With all the wild assumptions and predictions, you can pretty much force an Excel model to go anywhere. But that might actually be useful. The process of debating assumptions, seeing how much they actually matter, which ones are certain, which ones are a bit uncertain, and which ones are wildly speculative, weighing all the factors, is the communication process a consulting team and client will go through. At the end, the point estimate of "Option 3 wins with $52.3b value creation in 2035" might not be correct, but the thought process that went into the estimate means that option 3 is probably the most sensible option to take. Why do people need to hire expensive consultants to lead them through this process? Privileged access to information: data from another country, disguised industry benchmarks, etc. The analyst in the basement sees an endless stream of modifications of assumptions in the spreadsheet, but the client is getting the decision she wants. Presenting the results of such a project can be tricky. The slides themselves can be super simple (a ranking of 5 options by value created in 2035), but the sequence how to take people through is complicated. Discussing your Excel sheet page by page is not going to cut it. If you create a little waterfall, you can see the effect better. In both cases, the delta is half the size of the bigger column. Yes, using logarithmic scales would be the correct mathematically thing to do, but they are very hard for people other than mathematicians to get their head around. A tree visualises the composition (or decomposition) of a number into a number of factors. They are what I call ponder charts, not to be presented during a TED talk, but rather they are useful for (complex) studying relationships between different factors. Below are two examples of these analysis trees. The first is a summary profit and loss account for a company. I often use these a tree like this to visualise the business model of a startup by forcing a forecast year 5 P&L of a success scenario into this format. It is impossible to forecast the future accurately, and investors and founders will always disagree on the numbers, but the tree teaches you how to think about this company. What drives its economics? What would you have to believe for the year 5 scenario to be true? A tree always has to add up and multiply, this often leads to insights when it forces you to fill in boxes that you did not originally take into account (i.e., you forecast your sales, you assume market size, and right in the middle sits your implied market share). A second example is this return on invested capital tree. It explains how (and more importantly, why) company performance is changing over the years. In this version I added miniature line diagrams to make the annual trends clearer. PowerPoint cuts the vertical axes of these graphs automatically, amplifying the trends in the line graph. Normally, I would object to this form of lying with statistics, but in this case with the very small diagrams, it is actually useful. Both these trees go from left to right, sticking to the McKinsey style of going from big picture to detail. Clicking the images takes you to store where you can download the finished slides, subscribers can do so free of charge. Today, I am adding a simple table to the store to show the sensitivity of an analysis. Each cell in the table shows an outcome of an analysis with a slight variation on 2 critical input variables. I used this type of a slide a lot in discounted cash flow valuation models, where assumptions about discount rates and assumed perpetual growth could make a significant impact on the outcome of your analysis. The base case scenario is put very prominently in the centre of the table, it is the anchor for the viewer from which to start studying the other scenarios. I prefer making these type of charts manually, and not via a blanket copy-paste out of an Excel sheet. In that way, you have to think about whether each cell in the table is meaningful, and you can make sure that the data is formatted and rounded in the best way. 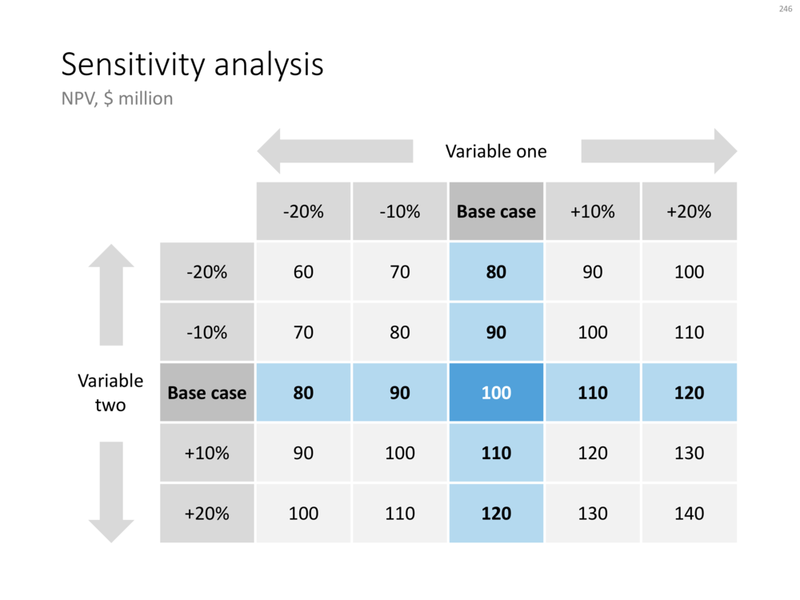 You can download this sensitivity analysis from the store, subscribers can do so free of charge. 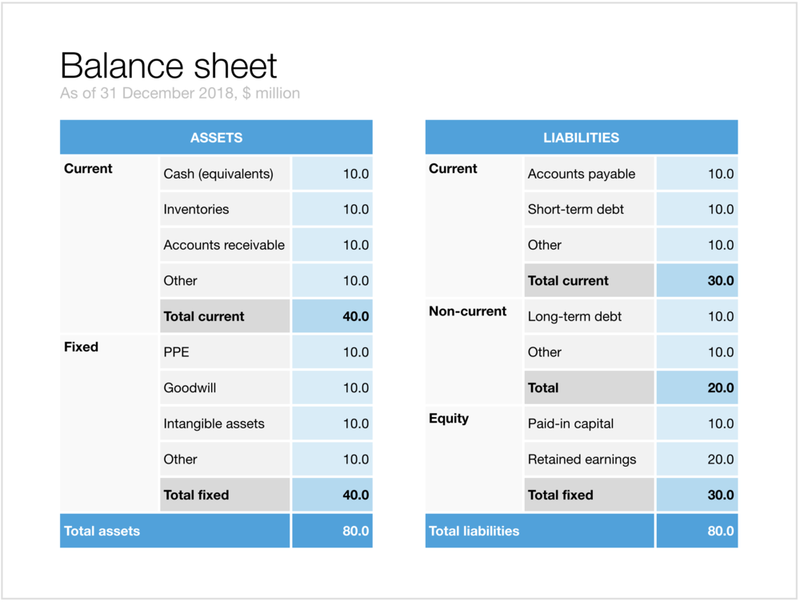 Today, I added 2 slides that show a balance sheet to the template store. The first is a traditional table format. But this PowerPoint version is a bit different from the a typical balance sheet in an annual report to improve the readability. Usually, the PowerPoint presentation with the financials is not the legally binding one, so we can omit some details that clutter up the page. This table has fewer lines (consolidating multiple entries into one), and the amounts are rounded up. The second chart is a balance sheet represented as a column chart. Even more details has been taken out and the result is a nice and unusual way to visualise the key balance sheet ratios. Instantly you can see the proportion between current and non-current assets (and liabilities), and you can see the leverage of the company (ratio between debt and equity). This chart is probably easier to follow than the Profit and Loss statement as a column chart which I discussed earlier. Click on the image to download the slides from the template store. Subscribers can do so at no extra cost. Recently, someone searched for a Pareto chart on my site. I must admit, I had to consult WikiPedia about this type of slide. A Pareto chart shows 2 data series, each with their own vertical axis; the first show the absolute frequency count of something, the second one the cumulative occurrence of the data series, adding up to hundred for the last entry. I have added the Pareto chart to the store. I often use the slide below in quarterly investor presentations for large corporates. How to give a quick overview of the key financials in one chart? The chart contains values that can differ vastly in range: sales can be 100s of billions of dollars, EPS can be less than a dollar. Margins are percentages, not dollars. Despite this, I forced the Q1 column of each of these values to be the same. In the underlying spreadsheet, they will all say "100". The other values are calculated as a relative value compared to this 100. To accentuate this in the chart, I connected the left columns with a dotted line. You can download this KPI chart from the template store. Here is a chart I usually use to present the result of a survey. How to create a waterfall chart. Waterfall charts are the secret weapon of McKinsey and other strategy consultants. They are great to explain the source of change between two values (last year, this year for example). In Excel they are tricky to make, especially if values zoom up and down the zero axis. When you want to show a P&L with very few lines, consider using a column chart instead of the more traditional data table. In the chart below you can see how to go about it. Use a bold color for the profit series, a light color for the COGS, and manually add the gross profit as bubbles. Things get a bit trickier for years where there is a loss. You create a separate data series in the same color as the last cost category (opex in this example), and calculate how much of the opex goes under the line and how much above. Tweak data labels manually. For these types of charts it is best to sketch them completely on a piece of paper, and then fiddle with PowerPoint/Excel to get it right. The column chart works well, it shows a number of trends in 1 slide: sales growth, profit growth, and how fixed/variable certain cost types are. Below is the data I used to create this chart. You can recreate your own chart with the description above, or download the example from the SlideMagic template bank. I replaced the chart with the one below in PowerPoint, using a line graph with big markers instead of the bars. Ideally, I would have like to flip the chart 90 degrees, but this would require quite a lot of PowerPoint surgery (you can probably do it with a scatter chart somehow). The other option is to construct a highly complicated "waterfall" chart. Financial projections of new business ideas are totally made up / not accurate, so being of by a few million here and there would not matter? We can make quick changes in our financials in the presentation slides, and then "forget" about updating our financials spreadsheet with the new information. While the absolute numbers of your financial model might be totally pulled out of the hat, it is the thought process of how you got to them that is still valuable for investors. How does your business model work? What would I have to believe in order for your year-5-dream-scenario to come true? A consistent model of totally made up numbers makes sure that everything is, well, consistent. If you just slashed sales & marketing cost by 50% but maintain the same amount of sales people, something goes wrong. Inconsistencies make it harder to understand your story for an outsider. If sales are $50m on one page and $49m on another people get confused. You established "$50m" as a mental shortcut for year-5-sales-in-the-most-optimistic-scenario, and all of a sudden you create a new shortcut. So, even if nobody can predict the future accurately. there is still value to create a consistent financial model the same way as you would for a business in which you know every single detail (next year's budget of an established company for example). What can you do to incorporate the fact that numbers are highly uncertain? Minimise the number of assumptions you put in the model and make cells that are guesses highly visible (I usually mark them bright yellow). Rather than "guessing" the number of customers for each year, and the number sales people for each year (10 assumptions over 5 years), you could assume a % growth of customers, and a fixed ratio of sales people to customers (2 assumptions). Slightly more complex models might actually be simpler to understand. There are endless ways to show financial ratios and benchmarks. Each industry has their own specific ones. Beer brewers think of the manufacturing cost of beer in terms of cost per hecto liter (not liter, not kilo), but when they think about distribution cost, they think per 6 pack case (not liter, not kilo, not bottle). The cost of sending a letter is usually in weight, the cost of sending a package is usually expressed in terms of volume. Retailers think in terms of sales per square meter. Technology startups think often in terms of per user per month. Find out what the norm is in your industry and adjust your financials.